Ethernet « Genesis Telecom Ltd. Choose the best connectivity alternative to keep yourself connected for years to come. Choose from simultaneous speeds starting from 10 Mbps up to 1 Gbps. Enjoy consistent and scalable bandwidth transmitted over a reliable network. Receive 24/7 support from our fault management team. Get Hardware Maintenance as part of the standard service. 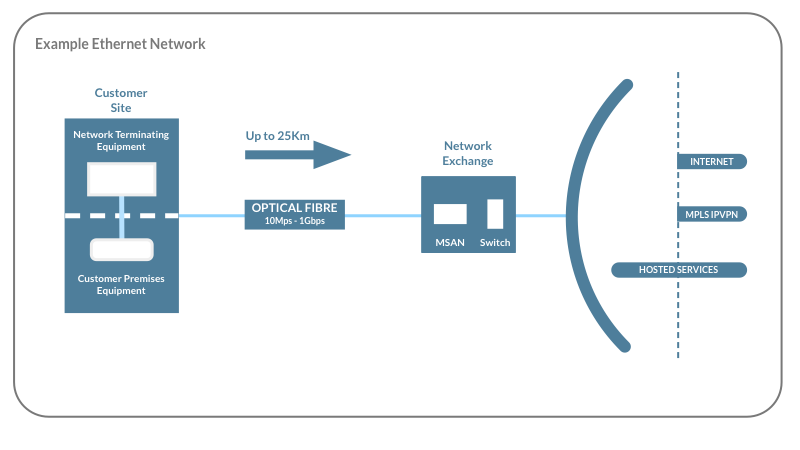 Close the gap to enjoy faster speeds without committing to full fibre Ethernet. Use Symmetric Copper Cable Solution. Choose between 2-pair and 4-pair frequency ranges with speeds of up to 10 Mbps or 20 Mbps. Built-in flexibility that features a copper pair with automated fail-over. Guaranteed 6-hour repair time in the unfortunate event of an equipment failure. Ethernet is a dedicated internet connection. Unlike broadband, you will have uncontended access to your connection whether it be FTTC, EFM or Fibre. This makes Ethernet an ideal choice for businesses that need extra speed for their premises or for hosting other services like VoIP, or both. Ethernet is a great way to boost your business’s productivity and we have multiple features and options to suit any business requirements. Benefits of an Ethernet Connection? If your business requires a consistent internet connection speed then an Ethernet connection is your only option as broadband is vulnerable to slow-down at busy times when the network gets choked with high traffic. As our leased line connections are uncontended you will have the same speed all day, every day. You will have total control over what bandwidth you want and it can be scaled up when needed. Genesis specialise in providing fast, reliable business Ethernet solutions that are feature-rich and cost-effective so you can concentrate on reaching your business potential. Genesis utilises data centres in Belfast, London and Manchester and its own Internet Protocol (IP) core network. This puts IP delivery in our control so we can guarantee low latency on our business Ethernet networks. For our international clients this means we can service worldwide locations securely and efficiently. “To date, we have been running the service for over a year and we have found the leased line service to be 100% stable, with no downtime. I have already recommended Genesis to other companies and will still continue to do so, enjoying the service and the relationship we have with the company.” – IT Manager, BCC Marketing Limited. Genesis Telecom are approved suppliers of the Government Connection Vouchers Scheme. Call to see if you are eligible to claim up to £3,000 towards Superfast Connectivity.